Typing feedback is much faster than handwriting it. 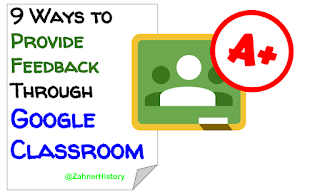 Although some teachers swear by handwritten marking and scoring, it’s hard to believe that they have given the options on Google Classroom much of a chance. 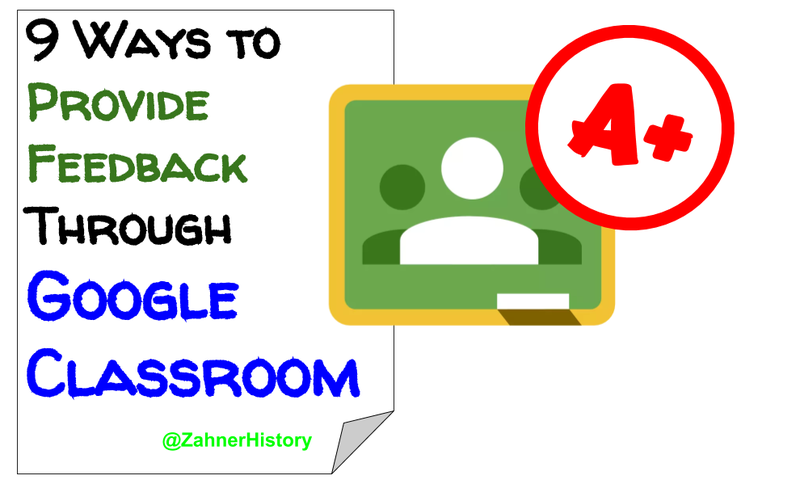 Google Classroom has the potential for a variety of assessments within the platform and even more ways to provide feedback to students. The following shares what I’ve learned using this workflow over the last four years, including some of the new features on the most recent update at the beginning of the 2018 school year. When a student responds to a question in paragraph form, for example, it gives teachers an opportunity to provide feedback. I look at this opportunity has the best chance to be a specific as possible when communicating achievement to a student. This is also a great opportunity to clarify a reinforced expectations, as well. If a students does not meet the expectations, I often have them reply to my comment with a corrected version of the paragraph. This allows the critique and revision process to stay in one place, which is often more efficient. How many times do you grade a whole class of assignments and realize that most of the students made the same mistake? When you return assignments to multiple students, you’re able to provide one comment that every student who receives that returned assignment can see. Usually at the beginning of the course, I have to write a lot of comments that reinforce writing expectations, such as what counts as acceptable evidence in support of claims. Students often start out the year writing rather vague statements to respond to questions, and it’s only after they receive specific feedback that points to the area that needs improvement that we start to see better results. Telling the whole class about a particular issue – or a select group of students that need a specific comment – saves teachers time from writing the same thing over and over. The sidebar on the assignment view screen includes a space to write a comment for the overall assignment. This comment is specific to the student work that you are currently viewing in that window but not tied to a highlighted area of the work. This comment option is especially nice if you have a general comment about the student's work. It’s also a useful space if, for example, you want the student to focus on one priority over another as opposed to perhaps all of the other comments that might be within the student work (see item 5 below). I like this comment tool because students will see it before they see the specific feedback within their work. This sort of general feedback is helpful when priming the student for receiving the specific feedback tied to areas within the assignment. The comment bank is also on the right side bar of the student work preview screen for assignments. It comes with some default comments that, although they can be useful, I have found them to be too general. To copy a comment, select the three vertical dots on the right side of the comments. A prompt to copy the comment should appear for you to click. This means the comment is in your clipboard and ready to paste wherever you want it. The best feature of the sidebar comment tool is the ability to add custom comments. I usually reserve these types of comments for the more general course expectations that I would expect all of my students to meet. So far on this list I’ve talked about some more general comments about the overall student work. Teachers can use the comment tool that's already in Google Docs to add feedback to very specific parts of the student work. This feature is fully available in the student preview screen for grading in classroom and works the same way as if it were being commented on outside of Classroom and within Google Docs. As a rule, I like to take this opportunity to ask questions about certain word choices to probe students to get closer to stronger work. It’s also a good opportunity to comment specifically on progress they’ve made with regard to a specific skill or content. Perhaps referencing a student learning goal or curriculum standard is appropriate at times. Since much of the feedback that students need on their work is very common, the CheckMark extension by Ed Tech team is the easiest way to provide it. The Google Chrome extension comes with preloaded comments that are common for many subjects, and users can customize the common palette. The whole process of using the comment palette is as simple as highlighting the area upon which you wish to comment and clicking the comment shortcut on the palette. The comment appears in the right margin – like any comment would – and users can move onto the next chunk of student work for further feedback. The check mark extension is different then the common bank on the right sidebar because users only have to click the item in the palette to make the comment. The comment bank built-in to the classroom student work previewer is different because it requires you to take the extra step of copying the comments to then paste where you want to place it in the document. Making a quiz with Google forms is one of the easiest ways to provide feedback to students. The feedback comes in both the simple form of indicating which questions they got right or wrong for selected response as well as the more in depth form of automated feedback based on their response. When a student answers the question, the form can provide predetermined feedback depending on whether they got the question right or wrong. The feedback is written by the teacher and can include links to resources to help the student better understand the content or dig a little deeper. I post Google form quizzes directly on the Classroom stream. This workflow works best for my students and I because I’m able to delete the post after the quiz is done. If a student misses the quiz or needs to retake it, I post it on the stream so that it is viewable only to the students who need to take it. The stream is a good place to provide general feedback to the entire class. Every post on the Stream can include comments to which students can then reply. Student replies could include clarifying questions, answers to questions posted by the teacher or other students, or just general comments about an assignment or other activity on the stream. This kind of feedback is especially helpful because of its public nature in the classroom. Students know that other students will see the comments, so there's an sense of audience that builds community. Likewise, students may ask questions that other students could also have but didn’t even know it or felt unsure about asking. Although the stream is, by default, a whole-class communications space, individual students can receive posts from the teacher. If a student is absent for an extended period of time, for example, this may be the best place to communicate make up work or other issues. This way, neither the student nor the teacher needs to go to a different place for the work or the communication. The nice thing about scoring a question or scoring in assignment is that the students get the results as soon as you click the return button. If the teacher scores the assignment in the afternoon, students don’t have to wait for the next day to know how they did. 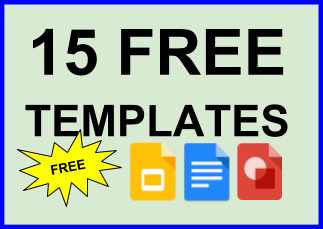 The ability to download a comma separated variables format for a Google sheet or Excel spreadsheet is also a nice feature when it comes to managing the data. Some online grade books allow you to upload entries via CSV file, making up dating grade books outside of Google classroom a more streamlined process. Although grading on a computer can take some time getting used to, the benefits are worth the effort of transitioning to a new workflow. The time saved managing the materials of student work and repeat feedback statements, in the long run, far outweigh handwriting everything on paper. Some teachers will never agree with my conclusions, so I challenge them to deliver the amount of consistent and timely feedback through analogue means.